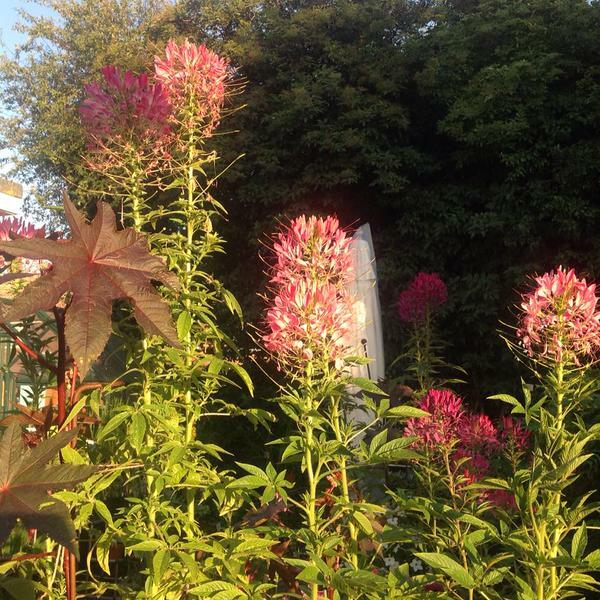 Thanks to Rosie McKerrell for this pic of her ‘Violet Queen’ Cleome. Higgledy Flower School 2016. #27. Cleome. Cleome is a contentious beastie. Some growers get offended by its little thorns. Others say it has an unpleasant niff about it. I can’t say that I notice these characteristics to any degree and Cleome is more than welcome to hang out in my cutting patch. However, it must be said that Cleome can be erratic to germinate. There seems to be two conflicting theories on how best to germinate the seeds. The first camp says ‘sow early’ as the seeds like fluctuating temperatures to get their Mojo wiggling into life. The second camp says ‘sow late’, as the seeds need good strong light levels to strut their funky chicken. 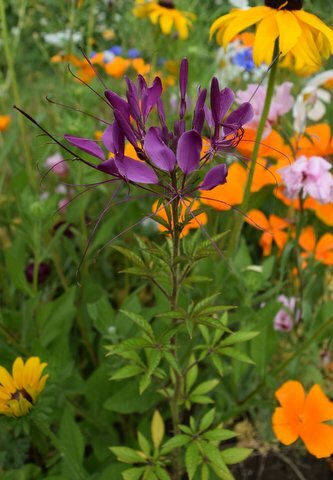 Another shot from Rosie…Cleome with a host of other goodies in a mixed cutting bed. I have tried both and have had erratic germination with both, but I have always ended up with more than enough plants for my garden. Being late flowering, Cleomes have a vital part to play in extending the productivity of your cut flower patch…it’s true to say they are not everyone’s cup of tea…but if you have never grown them I should give them a go and see for yourself. They will flower right up until they get duffed up by a meaty frost…usually in early November. These quirky plants are native to Central America, I have it on good authority (Dodgy Roger, down at the beach bar) that the name Cleome come from the Greek kleio meaning ‘to shut’…which may relate to it’s peculiar petals which only fully open at sundown. Equally it could be Roger spouting rubbish after five pints of Betty Stogs. 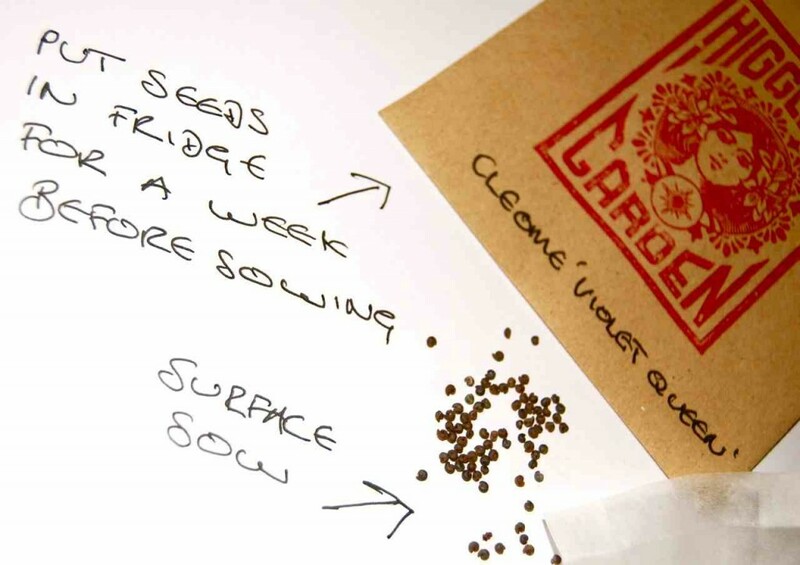 *I put my seeds in the fridge for a week before sowing…my plan is I am fooling the critters into thinking its winter…I have no idea if this makes any difference whatsoever but it makes me feel clever and crafty. 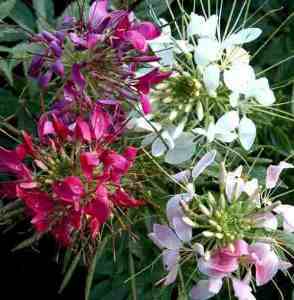 *Being half hardy your cleome seeds need to sown undercover. I sow my first batch in mid March and the second in late April. *I sow in three inch square pots rather than on to an open seed tray, to avoid disturbing their roots when I plant them out. 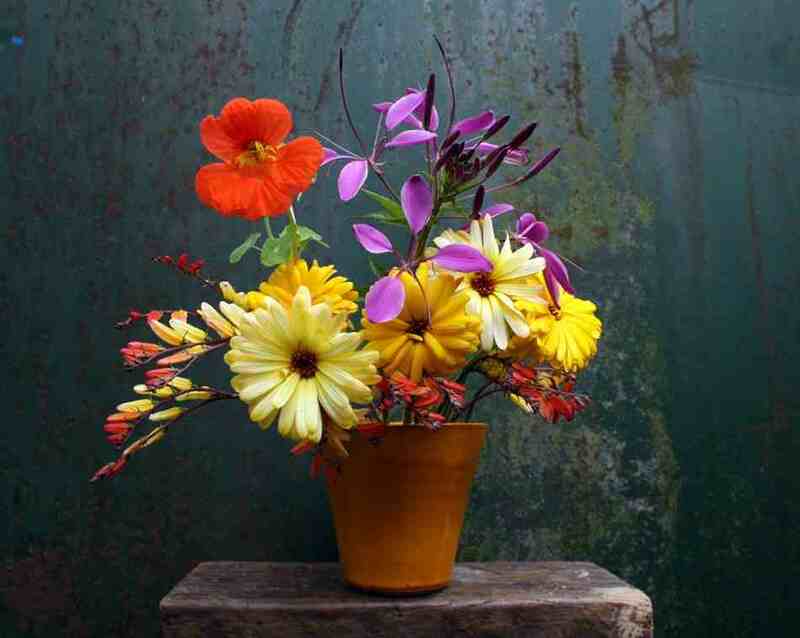 *They need light to germinate…so just firm down into good potting compost…don’t bury the blighters. Like most seeds they need to be kept damp…either water from the bottom or water gently from the top…preferably with a mister. Some folk put the seed trays in a clear plastic bag to help keep them moist. 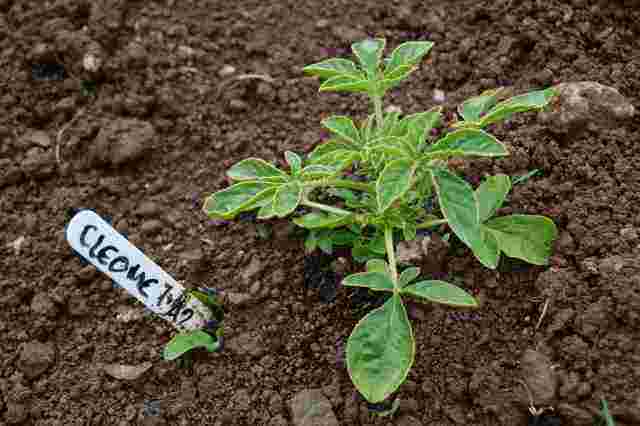 *Fluctuating temperatures will also assist the germination of Cleome seeds…cold nights and warm greenhouse days…or a window sill in the home and a few nights out side in the cold. 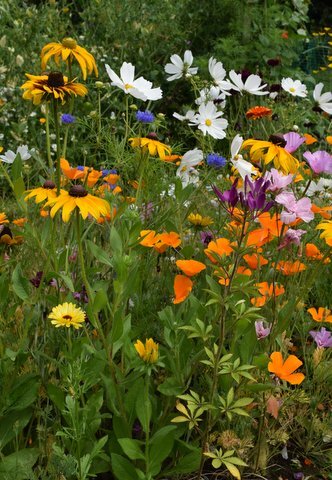 *You will get heaps of seeds in the Higgledy packet…so don’t skimp…sow quite thickly. *They must not be planted out until all chances of frost have disappeared…mid May and beyond is good. 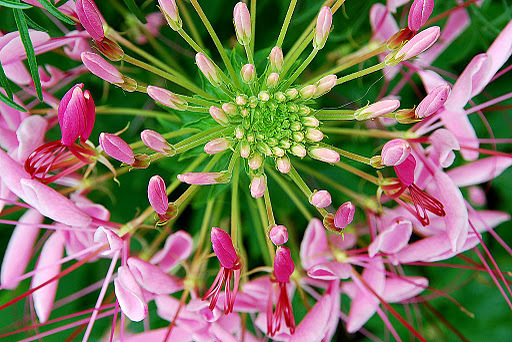 *Cleome prefer a deep fertile soil…so break up the ground and add some juicy compost to keep everyone happy. Mina lobata among some other nutters. Karen Wells pic. *Pinch them out if you want bushier plants. *I space mine to just over a foot apart. *In exposed areas they made need staking. *Give them LOTS of time to germinate…some of mine took up to six weeks to germinate this year. This year I shall be stocking ‘Violet Queen’, the colour is very intense and I’ve found her to be most reliable. I sell ‘Violet Queen’ at £1.95 for 200ish seeds. Nasturtium. Agrostemma githago. Corncockle For The Cutting Garden.